USS Worcester is a Tier X cruiser coming to Supertest soon. Please note stats are listed without crew and upgrade modifiers but with best available modules and are subject to change during the testing. With a range of only 14.7km (17km with the upgrade) BBs will have fun with this ship. No smoke but the need to show a good portion of the side to make use of all or at least most turrets. A bit disappointing that the ship uses the same 152mm gun stats as all other USN ships with this caliber. Compared to other T10 cruisers the ship will be a pain to play in my opinion. 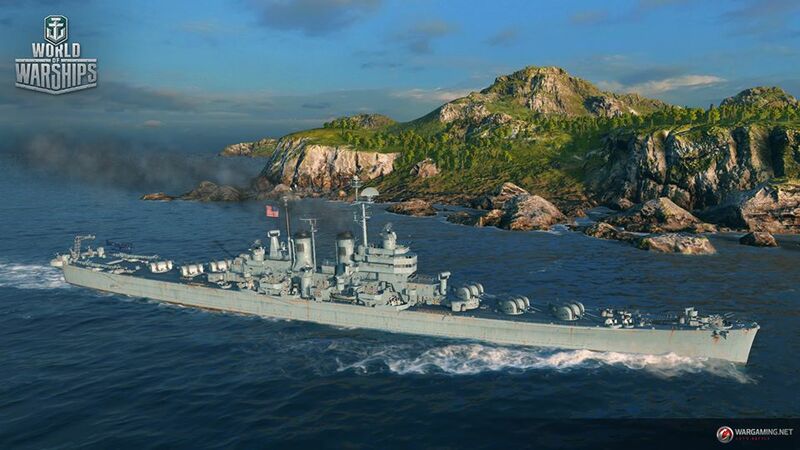 The Des Moines is definitely the better choice if you want to play an USN cruiser. If you buff the ROF the difference will only be 0.8 sec but DM is able to use 2/3 (6) of it’s guns without the need to go broadside – in the same situation the Worcester will only be able to make use of 1/3 (4) and lacking the power of the DM’s great 203s. Apparently, according to what’s been playtested so far, the best example of what this ship is like is if the Minotaur and Atlanta had a baby. It’s a nightmare to fight against. Essentially imagine if the Minotaur had HE and you get this. where are the 3D models? I really liked those. so this will come in the place of Des Moines ?